Our 2016 outreach efforts culminated in an April 2017 engagement event and a July 2017 daylong activation with temporary street closures, parklets, and plazas celebrating the vibrancy of the community. Since 2009, we have organized group rides around themes relevant to our communities. Spoke card by Ernesto Yerena, 2009. Since our formation as City of Lights/Ciudad de Luces in the fall of 2008, our group has worked to create accessible, bilingual, popular education about mobility safety. Our bike safety education model took its current shape in 2013, when, having transformed into Multicultural Communities for Mobility (MCM), we served over 450 low-income bicycle users through bilingual bicycle safety and legal rights workshops and distribution of free bicycle lights, helmets, and other safety gear. We have continued to serve Spanish-speaking street users all over Los Angeles County through workshops, rides, and events every year, and culturally relevant safety education is still at the heart of our work. Since 2017, we have offered workshops and rides through the Metro BEST program. Starting in 2015, MCM worked with the City of L.A.'s Great Streets Initiative through "Nuestra Avenida: César Chávez Reimaginada." Many of our members are based near Boyle Heights' Cesar E. Chavez Avenue, and there had been numerous fatal hit-and-runs there recently. We took the funding opportunity to spend time engaging with community members while LADOT added traffic calming designs to the street. We led a yearlong community visioning process along the community corridor. We held art events, canvassed, collected surveys, and hosted sidewalk charrettes to engage local businesses, community organizations, and families. We aimed to create a shared vision for streetscape improvements that would address traffic safety issues in the community. Our collaborators included artist Dewey Tafoya, CALÓ YouthBuild, and From Lot To Spot. GoHuman helped fund the efforts as well. The gallery below shares photos from our 2016 work. With Self-Help Graphics & Art and the UCLA Urban Humanities Institute, MCM hosted several art-based workshops in 2016 to highlight the issues of safety and visibility of low-income cyclists and pedestrians of color. Both events used temporary public installations of life‐sized cutouts of team members and family-inclusive bike rides or walks. On July 31, we facilitated a demonstration and art-making party at Mariachi Plaza in collaboration with residents and guided by artist Andi Xoch. On October 29, we held a Day of the Dead/ Día de los muertos walking tour of the ofrendas at Grand Park. Bike Parking in Central L.A. Soon after we got started in 2009, City of Lights volunteers noticed that the Central Los Angeles neighborhoods in which we did our outreach and education lacked bike parking stations, even though bicycles were a common form of transportation there. Some day laborers told us about an unwillingness to bike to the worker center because of the threat of bicycle theft, feeling unsure that they would find their bicycles waiting at the end of the day if they left them locked to fences and poles. The group researched the process for requesting a bike parking staple from the City of Los Angeles in 2009 and surveyed sites to recommend to the city. In the photos below, CoL members Andy Rodriguez, Julio Orellanan, and Efren Moreno Jr. are pictured surveying in December 2009. Thanks to CoL's efforts, the city added 73 bike parking installations. To build on this success, the group created a guide to the process so others could make requests. The Spanish language bike parking guide was released in early 2010, and in October of that year, CoL was proud to join Councilmember Ed Reyes (CD-1) at a press event to install the first bike parking outside of CARECEN's worker center in MacArthur Park. After working to ensure that the City of Los Angeles' 2010 Bicycle Plan included corridors utilized by low-income bicycle users, City of Lights partnered with the Bus Riders Union, CARECEN, and the Korean Workers Center to campaign for the installation of a bike lane on 7th Street through MacArthur Park. We believed that the best way for the plan to be equitable was to prioritize implementation in communities like MacArthur Park. The campaign culminated in a press conference with then-Councilmember Ed Reyes (CD-1) on September 7, 2011. For the press release, Reyes commented that, "By eliminating a car lane in favor of a bike lane we, as a city, are solidifying our commitment to the bicycle as not only a recreational vehicle, but as a legitimate form of daily transportation. That is what is most significant about today's announcement." There are many ways that an individual's immigration status enables or disables their mobility. This could take the form of anxiety they carry as they move through the city and fear arrest; it could take the form of them losing access to higher education in the only home they have ever known. In February 2011, City of Lights partnered with DACA youth to support the "L.A. to O.C. Dream Ride," an event that raised awareness about upcoming policy actions. The ride connected the Orange County Dream Team and Dream Team L.A. as the group rode from Corazón del Pueblo in Boyle Heights to El Centro Cultural de México in Santa Ana on February 20. The Orange County Register covered the ride, which included DREAMers and local supporters. An invaluable outcome of this ride for City of Lights was forming a relationship with artist and writer Erick Huerta, El Random Hero, who went on to become a core member of the MCM programs team. Because we felt solidarity with a population that uses bicycles but often gets overlooked, City of Lights experimented with various ways to include hispanohablante (Spanish-speaking) bicycle users in L.A.'s bicycle advocacy and policy. One of our favorites was working with day laborers to create a Spanish language street safety public service announcement (PSA) targeting Latinx motorists. While our team worked with filmmaker Jordan Melograna to produce the PSA, artist Aaron Kuehn created a colorful poster that could be installed around L.A. County as part of the campaign. In a video below you can learn more about our design process, which resulted in the message "¡Precaución! tu familia también usa la bicicleta" (Be careful! Your family rides bikes too). The campaign was funded by LADOT and REI. In 2014, MCM’s Boyle Heights Promotores program engaged local residents and small businesses to develop campaigns for bike lanes through discussions about gentrification and economic development. The project included a survey of the community’s bike and pedestrian needs, a much needed conversation on gentrification and how bike lanes do or not contribute, and a "bici paseo" that recruited local bike-friendly businesses to show their support. To get started, we recruited advocates from within the community. The Promotores leaders were able to create a space for the local community to engage in conversations on the importance of cyclist and pedestrian safety, issues experienced by cyclists in Boyle Heights daily, health and socio-economic inequities, and the very real problem of looming gentrification. In academic year 2016-2017, Dr. Allison Mattheis, Assistant Professor of Education at Cal State LA, provided research support to MCM as a Faculty Fellow for the Public Good. Dr. Mattheis taught two MA courses in Fall 2016 where students used MCM as their case study. One course focused on politics and policy, the other on qualitative research methods. In Spring 2017, Dr. Mattheis coached two graduate students, Sivan Levaton and Anell Tercero, in synthesizing the course findings into a policy brief. Dr. Allison Mattheis (center) with two students who presented a poster entitled "Gentrification and Transportation: Neoliberalism in Motion" at the February 2017 Cal State LA Student Research Symposium. The poster was based on research with MCM. Dr. Mattheis' own research is on youth empowerment and how to bring marginalized voices into institutional spaces. Along with MCM team members Maryann Aguirre and Adonia Lugo, she co-authored a chapter about biking in East L.A. that was included in the 2017 book Anthropology of Los Angeles: Place and Agency in an Urban Setting. The most well-known training for bicycle safety educators in the United States is offered by the League of American Bicyclists. In 2014, MCM contracted with them to translate their "Smart Cycling Quick Guide" into Spanish, making the training accessible to many more people in the United States. In October 2015, MCM and Metro convened ¡Mobilízate!, a week-long “rideshare party" in East L.A. We engaged cyclists, pedestrians, and (when safe) carpoolers along a route covering the busiest public transit hubs and stops in the area (view locations on the event page). We collected commuters' stories and invited them to celebrate their commute through a photo, a 15 second video message, or a hand-written message on a small white-board using the hashtags #RideShareWeek, #Mobilizate, and #ShareTheRide. Prompted by questions like, “How do you celebrate your mobility?”, “How do you get around?” and “Where are you going?/Where did you go today?”, participants shared a quick snapshot of their lives as street-sharing commuters. We gave out Metro-branded items such as bike lights, TAP cards, helmets, and reflectors. Meet Margarita - She shared with MCM about her daily commute around LA taking her daughter to school and going to work. Jonathan riding his skateboard and taking the Gold Line on his way to school! With funding from the Better Bike Share Partnership, PMJ joined LACBC in a collaboration with Metro to research barriers to bike share usage in downtown L.A., the first area where Metro installed bike share stations. Eastside Sol is a community celebration of art, music, and a healthy environment for the Eastside community of Los Angeles. This is a free event for families and residents to learn about and participate in clean energy demonstrations and pilot projects. MCM lead a family friendly Spanish-language bike rodeo that featured important bike safety lessons to encourage safe cycling in our communities. The rodeo was hosted bilingually ranging from basic bicycle maintenance to rules of the road when riding on the the streets. MCM League Certified Instructors (LCIs) provided hands on training on different bike riding techniques geared for youth and adults. The LCIs will begin with a safety discussion and share techniques on how to ride safely in a group, determine signals for communicating road hazards, and best practices for riding a bicycle in traffic with or without bicycle infrastructure (lanes, sharrows, paths, etc.). Each attendee will receive a certificate of completion as well as a helmet, bike lights, patch kits and maps of bike routes in the city. MCM partnered with Eastside Sol in 2016 and 2017. 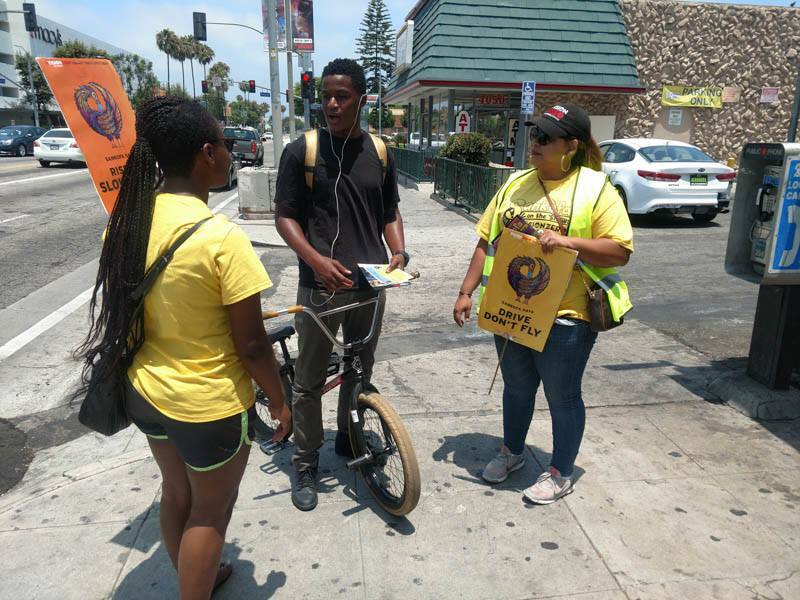 Since 2017, PMJ has facilitated a number of street activations as part of LADOT's Vision Zero program. Along with a circle of other community-based organizations (CBOs), MCM led an effort to learn about transit riders' experiences of the neighborhoods around Blue Line stations. This contributed to Metro's plans for improving connectivity in those areas. 2016's ride gets ready to head out from Mariachi Plaza. Since 2015, PMJ team members Erick Huerta and Maryann Aguirre have led an annual ride to celebrate the Chicanx pride expressed through public murals in Boyle Heights. 2017's ride was sponsored by Metro. The CARECEN (Central American Resource Center) Worker Center at MacArthur Park hosted City of Lights/Ciudad de Luces bike workshops on Fridays starting in April 2009. Here our volunteers spoke with day laborers (jornaleros) and learned about their daily challenges using bicycles for transportation. Our engagement grew from bike light giveaways to workshops on bicycle users' legal rights and bike repair with the Bicycle Kitchen/Bicicocina. 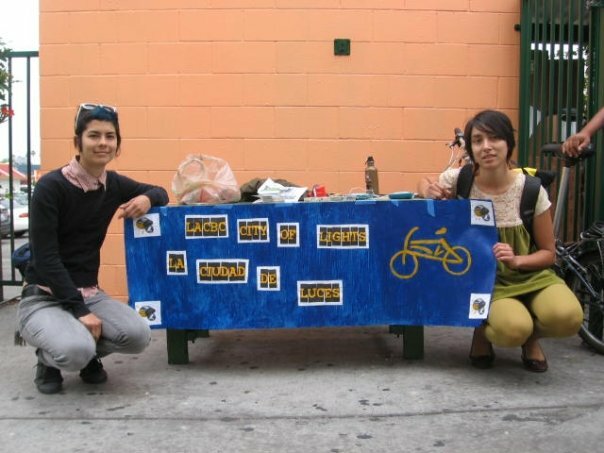 In October 2009, volunteers launched BiciDigna, a bicycle repair cooperative at IDEPSCA's Downtown Worker Center. The relationships we formed at CARECEN and IDEPSCA shaped all of the advocacy work that CoL launched while being incubated at LACBC up to 2012. we set up at IDEPSCA’s worker center. We received invaluable advice from the UCLA Labor Center and the National Day Laborer Organizing Network (NDLON). April 2009. Photo by Allison Mannos. Bicycle Kitchen/Bicicocina holds a workshop at CARECEN in 2009. Video by Adonia Lugo. In 2010, City of Lights created a Spanish language cycling resource guide. The goal was to create a culturally sensitive, accessible pamphlet that we could distribute to Latino/a cyclists around town and make available for free online. The guide covers safe riding and equipment (the proper way to ride on the street, seat height and a detailed map with routes to workplaces), basic maintenance (brakes, replacing flats), advocacy and legal rights (If hit by a car, how to advocate for better infrastructure), and more. By September 2010, City of Lights had distributed 600 guides. Funded by REI and the MacArthur Park Neighborhood Council.